Greetings all! And welcome to my blog! Though first I must make a confession. I had another blog under a different profile and gmail account. However I had neglected it for so long I had forgotten my gmail account completely! I'm a little embarrassed to admit it, but that is the truth. Anyway, since I've lost access to that account I thought why not start over from scratch, right? Oh, and one more disclaimer. At present, this blog is for a PROPOSED On20 scale/gauge layout. I currently am not able to built the model railroad, however I will be working on locomotives and rolling stock for the railway and I will keep my watchers/readers informed on their progress. Most of what the first few posts will be are my plans and intentions for when I can finally start putting the benchwork together. So please, have patience and I promise that you will be satisfied with my endeavors. Ok, then! Now that's out of the way time to move forward! The Ocalla Tramway is going to be a freelance On20 gauge 4x8' layout with the intent of taking to model train shows to promote the unusual scale/gauge combination. But what is the Ocalla Tramway, and more importantly what it On20!? Well all those questions will be answered. Simply put, On20 is "O" scale on HOn3 gauge track. 20" gauge railroads are almost unheard of, however there were a few rare examples of them that operated here in the US. 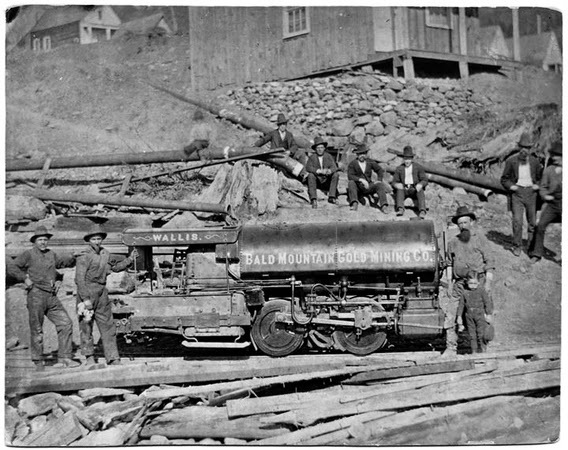 The first being some of the mines of gold mines of California where this chunky Baldwin built locomotive operated. And yes, it was in fact 20" gauge. Affectionately known as the "Wallis", it was a coal burning 20" gauge 0-4-0 built in 1876. The engine was only 5'3" in height so that it could steam its way into mine addits and drift tunnels. As a side note this engine has inspire my own mine locomotive, but for the more common 18" gauge (On18, O scale on N gauge track) which I have lovingly titled "Spud". And now to get back on track, if there was one place that was known for having 20" gauge railways it would have to be the mystical territory of Arizona. Three different operations in two different areas of the state had 20" gauge lines. 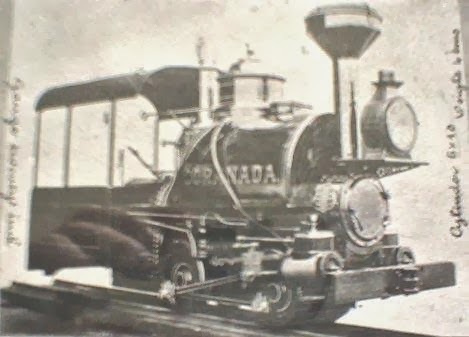 The most famous being the Arizona Copper Company and their fabled Coronado Railroad. The ACC built not only the first narrow gauge railway in the state, but also the first 20" gauge line running up Chase Creek Canyon outside of Clifton, AZ in the late 1870s. 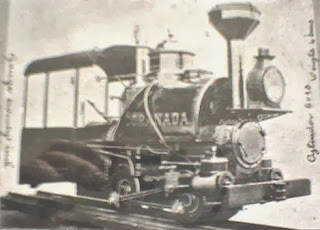 Their first locomotive was built by H.K. 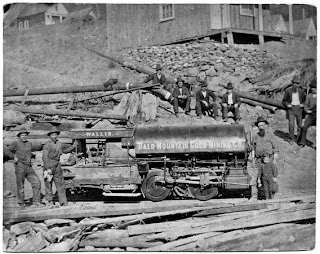 Porter and delivered to the ACC in 1880.
and the "Nature's Wonderland Mine Train". 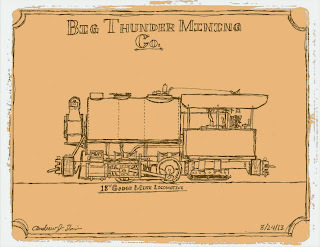 This On30 layout would be named the Big Thunder & Western and would incorporate three other 30" gauge lines also. 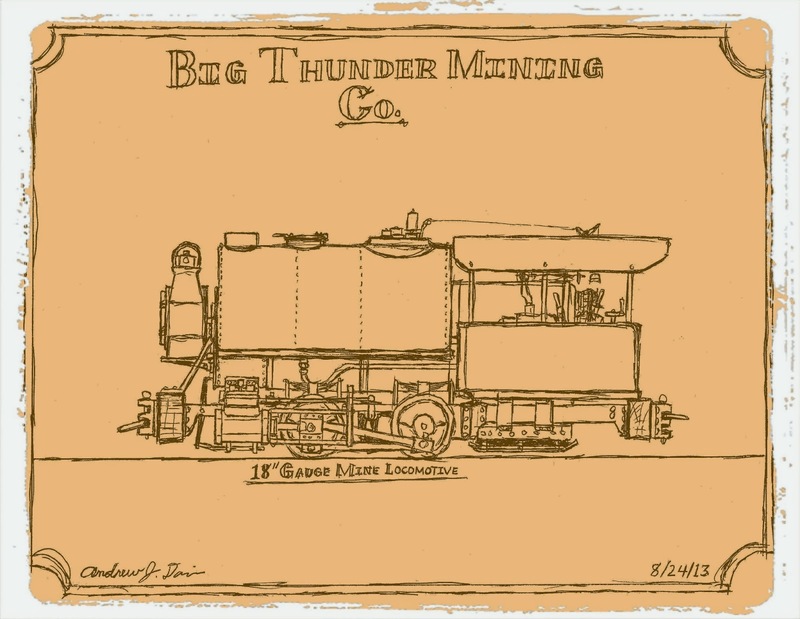 The Big Thunder Mining Co. and the Big Thunder & Prescott RR, the BT&W's connection to the outside world. Although a common carrier the line's primary revenue would be from copper ore, worth more than gold at the time in Arizona. And it breaks up the stereotype of "Gold" or "Silver" mining in the west. However, an idea came to my mind as I was designing this layout, which is still under revision, or rather a question came to mind. What if the BT&W couldn't reach some of the mine along the cliffs and canyons? Well a tramway would make logical sense! And originally I was going to use an On18 line to do so, but as I delved into the history of Arizona I came across the 20" gauge and then shortly there after the 20" Gauge Modeling group on Yahoo! After learning more about modeling On20 I was set on the scale/gauge. Why? Although it is easier to bash models in On18 it lacks the historical congruence and authenticity that On20 offers to an Arizona based layout. That and it's a challenge... and different. As a modeler I am always attracted to more obscure things with model railroading, whether it be scale or gauge, or both! And even more so if it requires a lot of modification, kit-bashing or scratch building! Those aspects bring me back to how our hobby started, when there weren't pre-manufactured kits to assemble or Ready-To-Run stuff on the shelf. Back when EVERYTHING had to be fabricated or you didn't do it at all. Throughout this blog I will post and keep updates on my modeling progress with both locomotives and rolling stock, and perhaps other equipment I may find suitable to build for my Ocalla Tramway. After delving into a little history and what On20 is my next post will be about the tramway itself! Stay tuned and you won't be disappointed! !